When Heroes of the City approached me to do a review of their products I was more than excited to say yes! Just by looking at their website I could see my boys would be excited but also tough critics for their line. By that I mean, if the movie and apps could entertain them and if the cars and book could survive them, then Heroes of the City would become one of our new household favorites. Heroes of the City is a television cartoon about rescue vehicles in a small town where everyone can be a hero! 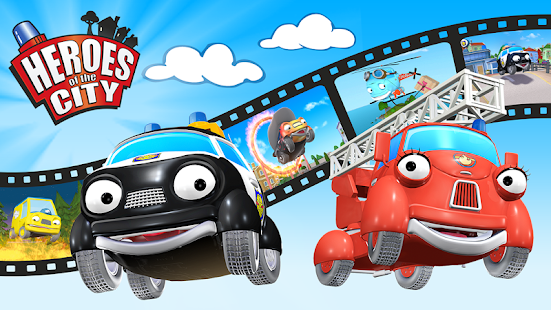 Meet Paulie Police Car and Fiona Fire Engine as they help the townspeople find thieves, put out fires, and solve one of the many mysteries that happen in the otherwise quiet town. You will also get to know Calamity Crow, the most unlucky bird in town. The Heroes of the City Movie app is an all-in-one, safe and fun children’s application. It’s a perfect app for children ages 2-6 years that includes both movies and games based on the popular television series Heroes of the City. The Heroes of the City Movie app is available to download for free here on iTunes for Appleand Google Play for Android. We have really enjoyed the Heroes of the City. For starters, everything I received was made extremely well. I think the book pages and the binding will hold up between my two little testers. The storyline was so captivating it kept the attention of my 2 year old with vibrant pictures that looked just like the movie. The DVD has been requested over and over again so that definitely says a lot. I like the message that the movie portrays, that friends have more fun when they work together and play together. I think the Heroes of the City Movie explains this important point by showing several different examples in a collection of short stories. Oh, but let’s not forget the cars! My goodness the excitement! We received Harry and Fiona who have to be in hand whenever Heroes of the City activities are happening. But the app, now that is really neat! The graphics are very impressive and it’s all so easy to use. The very best part is now we can take our Heroes with us everywhere we go on our tablets or our phones. That means this momma has two very happy little boys! The Book, Movie, & Apps are all beautifully made with amazing graphics. They are even entertaining for parents and don’t make any obnoxious noises…total bonus! The apps are very user friendly and there are lots of games to keep your munchkins busy when you’re in a pinch. The book and cars are durable enough for 2 and 4 year old boys as well as entertaining and appealing to both ages. Plus if you go to their website they have tons of printables and fun games to play. There’s also another free Heroes of the City Book App that gives you the option of reading the stories yourself or having them read to you! I received this product complimentary for testing purposes from Heroes of the City. If you would like to view the apps please use the links provided. I only recommend products or services I use personally and believe will add value to my readers. The opinions expressed are 100% my own. Thank you as always for reading and your ongoing support!